For a different look, change the color of the center string or the fabrics used. I cut my sashing 2.5 inches for this one and added colorful cornerstones cut 2.5 inches square. Your work is beautiful. You and your mom make an incredible team. Love the colors you have chosen. Thank you for the ideas and the how-tos. These are absolutely beautiful, I like ll of them. Wht talent. Thanks for sharing! for anyone who has not tried making these blocks you really must. they are quick fun and before you know it you have a quilt done ready to give to a worthy cause. I just love your site. 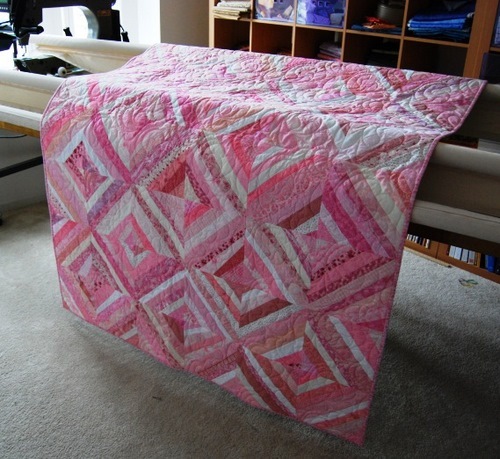 I have taken one of your photos.. the above pink quilt and put it on my blog with a link back to you. I hope that is ok.. Just thought my readers might be interested in what you have. I cannot wait to get my studio cleaned up (LOL) so I can make one of these. The big stumbling block? What color do I want to make? I’m leaning towards using some Civil War repros. I’m excited!!! I love these!! !